1. How to Detect a TCP/IP Denial of Service Attack This are the commands I use to find out if a loaded Linux server is under a heavy DoS attack, one of the most essential one is of course netstat. If the output of below command returns a result like 2000 or 3000 connections!, then obviously it’s very likely the server is under a DoS attack. 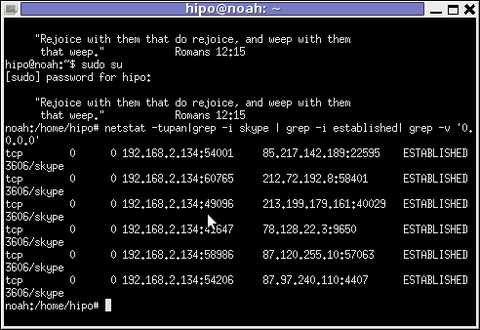 As you could see from the above command output the IP 80.143.207.107 is either connected 221 times to the server or is in state of connecting or disconnecting to the node. Here is how lsof can be used to list the approximate number of ESTABLISHED connections to port 80.
linux:~# watch "lsof -i TCP:80"
As you can see the above one liner in a loop would check for sent and recieved ICMP packets every few seconds, if there are big difference between in the output returned every few secs by above command, then obviously the server is under an ICMP attack and needs to hardened. In many cases of course the top or htop can be useful to find, if many processes of a certain type are hanging around. The above command will list information concerning possible UDP DoS. If after getting an IP that has too many connections to the server and is almost certainly a DoS host you would like to filter this IP. You can use the /sbin/route command to filter it out, using route will probably be a better choice instead of iptables, as iptables would load up the CPU more than simply cutting the route to the server. The above command would null route the access of IP 110.92.0.55 to my server. Well hopefully this should be enough to give a brief overview on how, one can dig in his server and find if he is under a Distributed Denial of Service, hope it’s helpful to somebody out there. This modules solves problems with Active FTP not working caused by a host running behind a firewall router or behind a NAT. This will hopefully resolve your issues with Active FTP not working on CentOS. If loading this two kernel modules doesn’t solve the issues and you’re running vsftpd FTP server, then it’s likely that the Active FTP non-working problems are caused by your VSFTPD configuration. As you can see the two modules ip_nat_ftp and ip_conntrack_ftp are now loaded as additional modules.